Thompson Memorial Park is located on the south side of the City of Hudson. Most of the park is developed and groomed for soccer fields, play areas, and a picnic pavillion. But the east end of the park bordering Bean Creek is largely undisturbed, and many native plant species thrive on the streambanks. The Bean takes some easy turns in this stretch of the watershed. 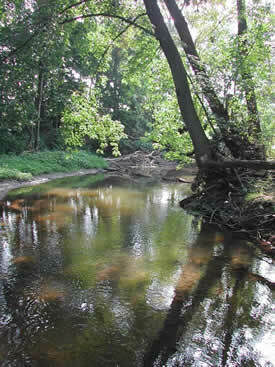 The stream is bordered by large cottonwood, sycamore, and willow trees. 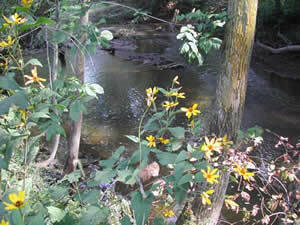 Many wildflowers grow in the stream floodplain, including boneset, coneflower, and wild cranberry.